Plugins, many times, are not vital to your site’s performance, and they just slow down your load time significantly. I’ve been through a lot in terms of messing with WordPress and adding unneeded plugins, but I have found some quality pieces of code that all blogs should implement, and I would like to share them with you. Basically, these are the two most important things to look at. If plugins get a lot done for your site, but conflict with your theme, they’re completely useless. These plugins have been tested on three different themes and worked for all three. So, they will probably not conflict with anything that you have on your site. Yoast is run by a wonderfully helpful man named Joost De Valk. You’ve probably heard of him, since he’s a pretty big deal when it comes to coding and plugins. The Comment Redirect plugin that he designed is very simple (there’s only one option), but it is a vital add-on for any site. When a first time commenter leaves a reply on one of your posts, you have a chance to convert them into a loyal reader! One of the best ways to do this, other than using the Newsletter Sign-Up plugin, which comes later, to add an opt-in checkbox, is to redirect them to a page of your choice. That’s exactly what this Comment Redirect plugin does. The only thing it requires you to configure is which page you are going to send the commenter to, and it lets you pick from a drop-down menu. 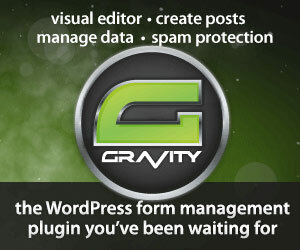 Gravity Forms is the only plugin on here that is not free, and the only one that you can’t get by just searching under the “Add New Plugin” button in your WordPress. I had to pay $39 for Gravity Forms. Just kidding, I found this coupon that gives you 20% off all license. Gravity Forms makes it incredibly easy to set up contact forms. It uses a drag and drop interface that lets you add fields such as name, email, URL, checkboxes, and more! You can also include an Aweber or Mail Chimp Add-On that allows you to add an opt-in checkbox to all of your contact and registration forms, which is a great way to gather some subscribers. You can pick up this plugin from Gravity Forms. The Comment Reply Notification is a plugin that seems superfluous, but your theme might surprise you. I have been running a blog since 2008, and I had no idea that commenters were not notified of followup comments. Some people would check back and reply to my comments, and the one’s that did not I just figured were not engaged in the subject. Your theme might surprise you – none of my three themes were notifying commenters of replies! This, to me, seems like a given! Get this plugin now if you find that your commenters are not being notified of replies! You are able to customize the email that sends out to your readers when someone replies to their comments, and there are other various settings that you can play with within the plugin. Newsletter Sign-Up has a ton of great functions, and it’s free, but there is one major reason why I downloaded this plugin: I want to build my email subscriber list. I had tried other plugins before which were meant to add an opt-in checkbox to my comments, but none of them gave me the option to leave the comment box checked! This is vital – readers are as unlikely to check the comment boxes as they are to uncheck one’s that are already filled out. This plugin really helped me get some more names on my email list, and I think that it will do the same for you! The Social Sharing Toolkit could be called “yet another social buttons plugin,” but it’s really much more than that. It’s a “social buttons plugin THAT ACTUALLY WORKS.” The button counts are always accurate, all of the buttons work (except the Pinterest, which is Pinterest’s fault), and it doesn’t conflict with themes! It shows up where you want it to, and doesn’t move other pieces of code around like some plugins do. There are plenty of design options, and I recommend switching to this plugin if you’re not satisfied with the social buttons that you have now.